Windows Media Player has been part of Windows since 1991, the media player is already an antiquity. Its most recent version is October 2009, it was never updated for Windows 8, or 8.1, much less Windows 10, and nevertheless it continues to be included in the operating system. According to a capture published on Reddit it seems that Microsoft is beginning to suggest very “delicately” that you stop using it and go to the Movies and TV app that includes Windows 10 . And although the message may seem annoying to some, it is not a bad suggestion at all. 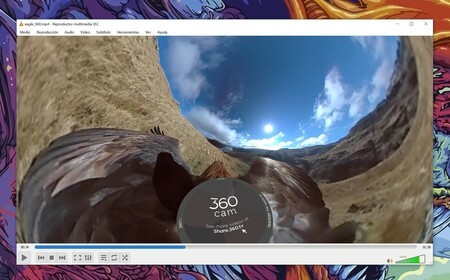 The capture shows a pop-up warning when you open Windows Media Player that promotes the Movies and TV app and suggests the user to open the content in the modern app instead of the eternal dinosaur. Also take the opportunity to tell you about some of its functions and offers a button to set it as a player by default in a click. With so many quality media players, why would you use Windows Media Player? Perhaps those who do not know another alternative, or who are not very open to changes have continued to use WMP more for known than for another reason. 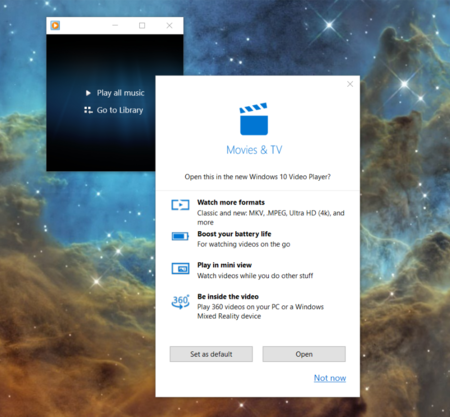 While the Windows 10 Movies and TV app is more than acceptable and meets all the basics, there are many other third party alternatives that are as good or better and also free. The first obvious recommendation would be VLC , especially now with the release of version 3.0 with support for Chromecast and 4K video playback. My personal favorite is Media Player Classic Home Cinema (MPCHC) , lightweight, customizable, open source and free. Others like Pot Player are usually highly recommended by Genbeta readers. And if you’re looking for a music player there are lots of options . As interesting and modern as Plexamp , or classics that do not die like Foobar2000 . Next Post: The latest Windows 10 update arrives: what’s new and what should you watch out for?